TORONTO - From career wear to cocktail chic, Rachel Sin showcased styles spanning all four seasons with her latest presentation at Toronto's World MasterCard Fashion Week on Wednesday. The womenswear designer made her return to the runway with a joint presentation of her fall-winter collection as well as her spring summer line. "It's a day to night look," Sin said backstage following the show which was inspired by the urban jetsetter. "It's all about versatility and being able to mix business with pleasure." 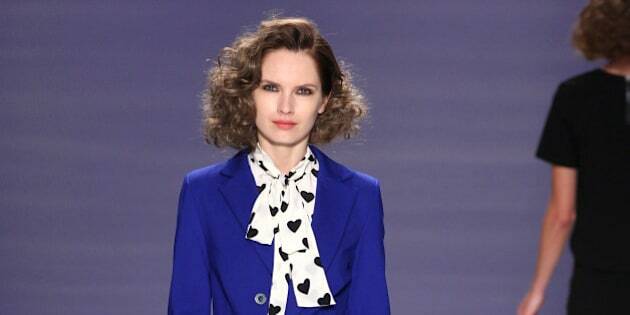 The fall-winter "work" line incorporated bold hues like oxblood and cobalt blue, showcasing a mix of sleek, tailored looks encompassing colour-blocked sheaths, slick suiting and pretty patterned tie-neck blouses dotted with heart prints. The shift to "play" in the spring-summer collection showcased an extensive range of vibrant hues and patterns including mint green, lemon yellow and digitized floral prints. Sin said she always uses ponte — a double stretch knit — and also opted for a lot of jersey in the spring-summer designs due to the lightness and airiness of the fabric. The warmer-weather offerings showcased a collection of ultra-feminine offerings including A-line skirts and dresses. Sheer mesh panels were also incorporated into several of the designs. "I think that just accents the piece and it draws the eyes to the detailing and it makes any little black dress interesting," said Sin. The Toronto native has ties to Ottawa, having graduated from Carleton University and launching her label in the city. The trained architect turned fashion designer also presented previous collections at the now-defunct Ottawa Fashion Week. Sin said she had been occupied preparing for her runway show and hadn't had time to process the fatal shooting of a reservist and the harrowing events in the nation's capital on Wednesday. "I haven't had a moment to take it in," she said. "We've been so busy with the prep, but my heart goes (out) to Ottawa because I love that city. That's where the brand started."